FL-CT-7 on 6/1/2014: "I was one-half mile from my home when the rain started yesterday afternoon. It was like driving through a car wash."
FL-PB-12 on 6/10/2014: "A day full of smoke from the brush fire in the Everglades, thunder could be heard in the afternoon but no rain here." 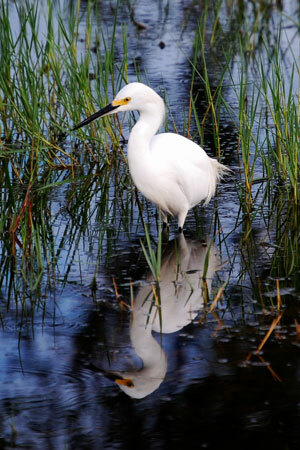 FL-BW-45 on 6/19/2014: "There was a small amount of rain in the gauge, however it was contaminated with bird droppings. Unknown exactly how much rainfall." 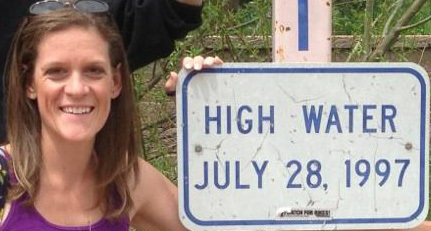 FL-AL-26 on 6/23/2014: "A passing bird or gust of wind dropped a blueberry into the funnel of the rain gauge, but it's unlikely it affected the overall amount of measurable rainfall!" FL-BW-48 on 6/28/2014: "Rumbling and lightning in the distance yesterday afternoon. I could even see rain falling in the distance. But here, at this station, not a drop. A trace this morning (or condensation? ), anyway, not enough, I needing to water the garden... :-)"
In June, the National Weather Service focuses on rip current and lightning safety awareness weeks. A rip current forms when waves break near the shoreline, and some of the waves break stronger in some locations than others. 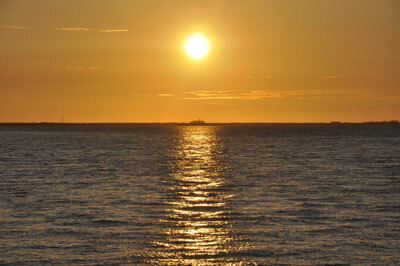 This causes a circulation of fast-moving water that travels back offshore. Even the most experienced swimmer can get caught in a rip current and unable to break free. So far in 2014, 5 people have lost their lives and 6 people have been rescued from rip currents. 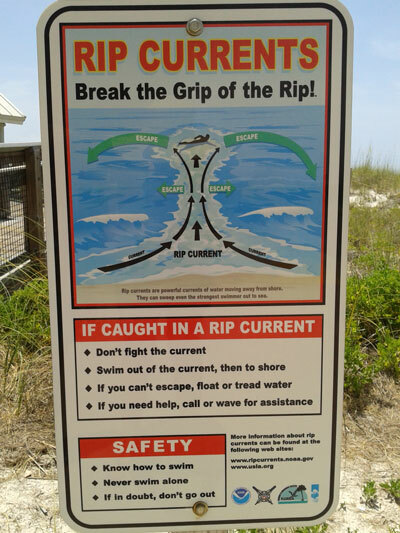 There are signs posted at most beaches of a diagram of what a rip current looks like, and what to do if you're caught in one. 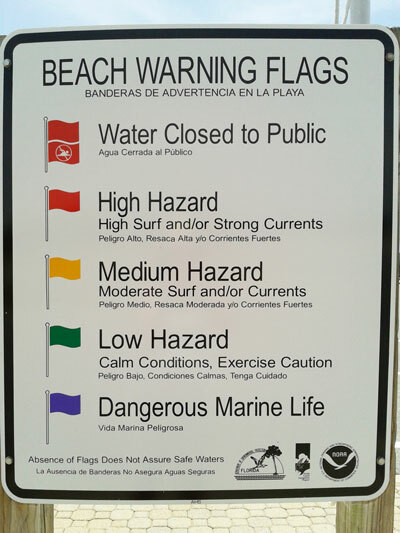 In addition, the state of Florida has a beach flag system that can easily describe the surf condition based on a color scale. Florida is the lightning capital of the continental United States, with some portions of the state seeing an average of more than 30 strikes per square mile each year. Since May 4 fatalities from lightning have been reported in the state, and June, July and August are months when there are increased outdoor activities. 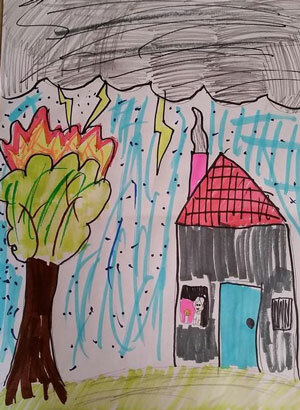 Remember, "When It Roars, Go Indoors." This is a good time to review the excellent information and resources that the NWS has pulled together. If you have any visitors coming from out of state, it may be good to send them the links provided, so they can make sure they are aware of these summer hazards here in the Sunshine State. I've said it a bunch of times, but it's the observer that make this program so valuable! And I love to highlight them, when given the chance. 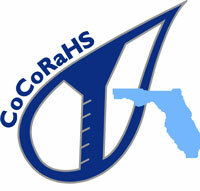 Many of you take wonderful photos throughout the year, and some have had their photos put into our previous CoCoRaHS calendar. This month, I have the pleasure of sharing some pictures taken from Don, one of our original observers from 2007. 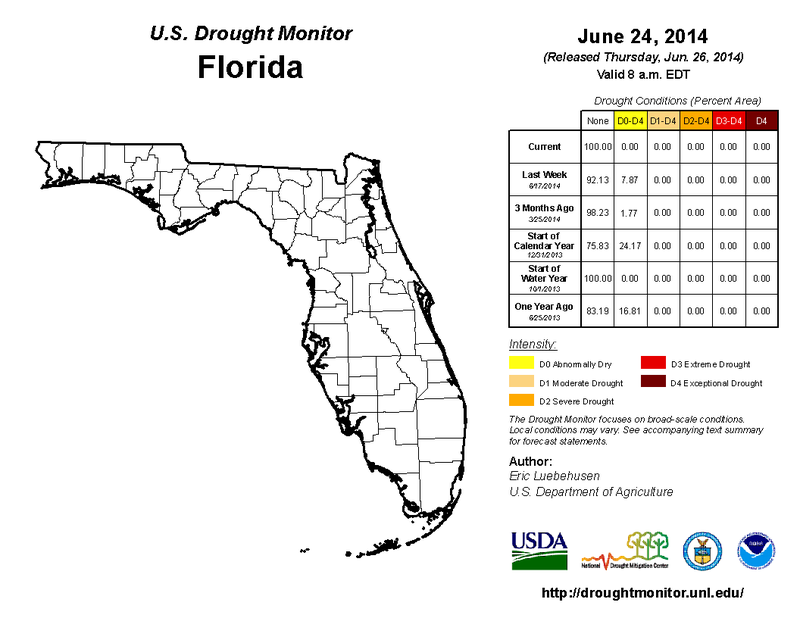 The National Drought Monitor showed that the lack of rainfall for the at the end of May led to an increase in observed drought conditions, with moderate drought (D1) to be recorded for coastal portions of Collier, Dade and Monroe counties. 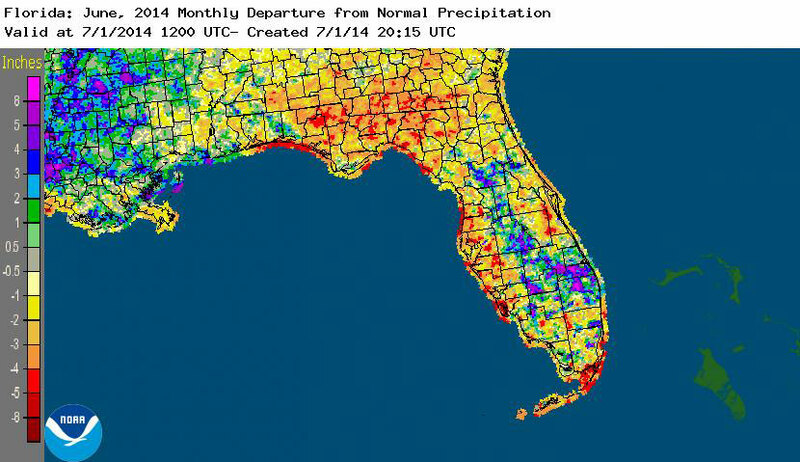 The Everglades, along with most of the Gold Coast were experiencing abnormally dry (D0) conditions for the first two weeks of the month. 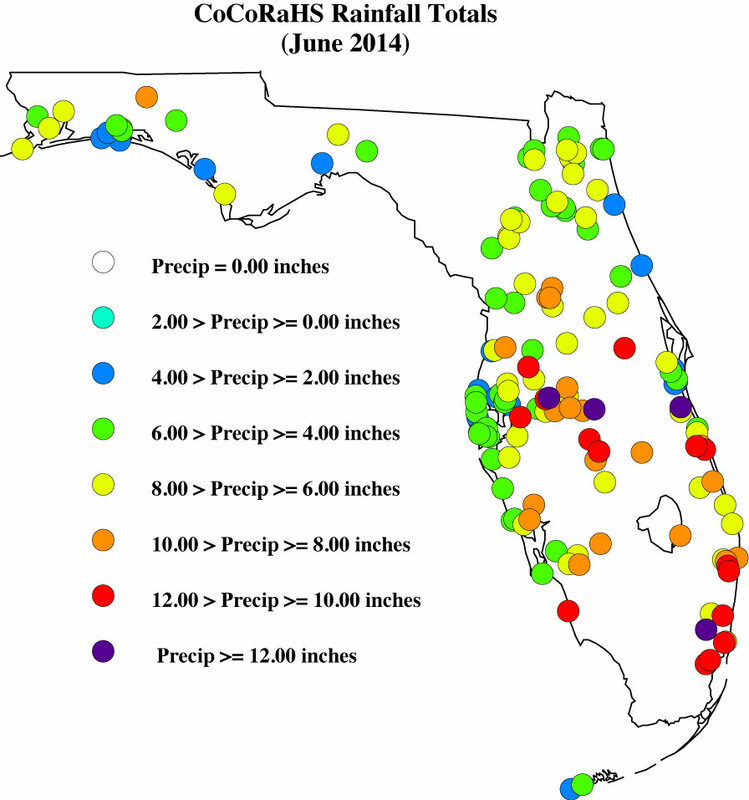 Around the time of the June 17th release, rains in Southern portions of the state had eased the moderate conditions and had cut back the D0 to all of Dade and Monroe counties, and portions of Broward and Collier counties. Continued rains through the remainder of the month further alleviate drought conditions across the entire state. 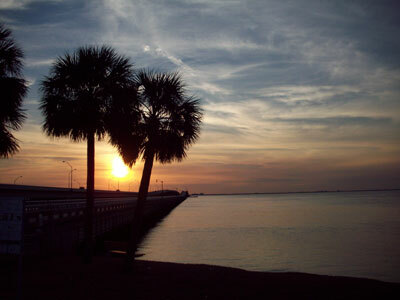 Lake Okeechobee is currently at 12.95 ft., which is up from the end of May.